Within 3 days, we had 3 dog pillow needlepoint canvases under way! We all agreed that 12.25″ x 12.25″ will make a good size pillow, and the pillow forms are easily available at JoAnn Fabrics or Michaels. 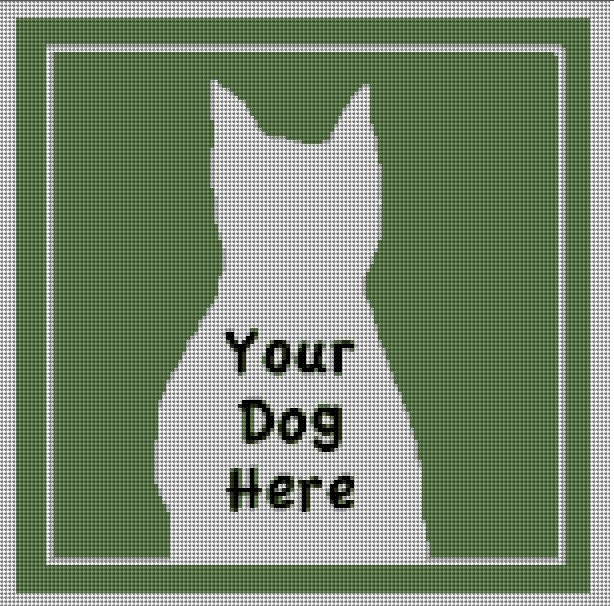 I was thinking that it would be cool just to put the dog’s profile on the pillow and remove the background (this will be faster to stitch, too). We also added borders as to frame the image, and this was a big hit! In the end, we had three completely different designs! They all are special, and it was fun. I have designed another fun background and will be happy to do more, just email me your ideas! A fun deisgn for a black dog! 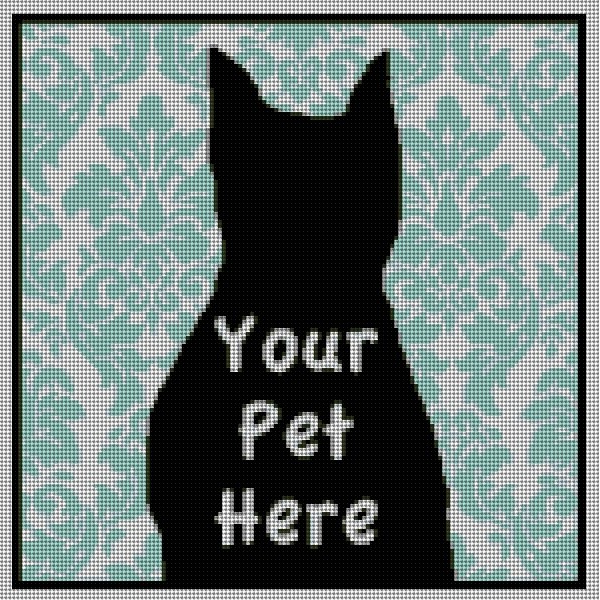 All three needlepoint canvases are under way right now, so we are waiting for images, but I’m guessing it will be a few more months. 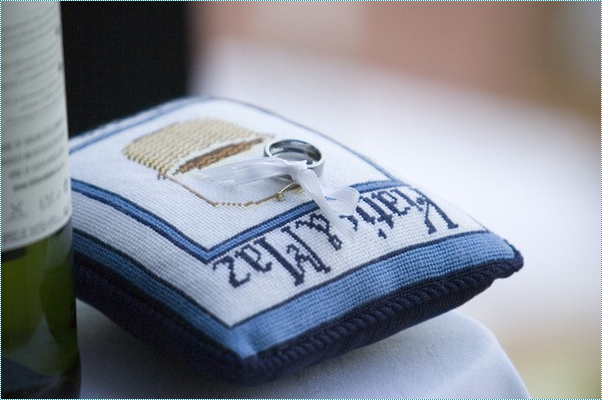 One of the needlepointers just emailed me an image of their last kit we made for them! ***We are now showing designs on Etsy! 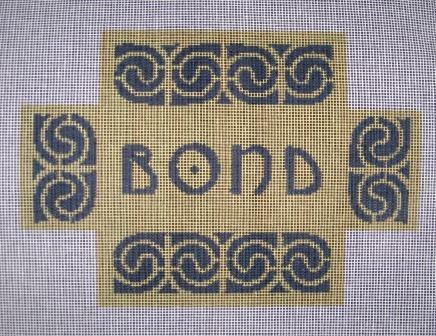 Check out our designs at our NeedlePoint Shop. 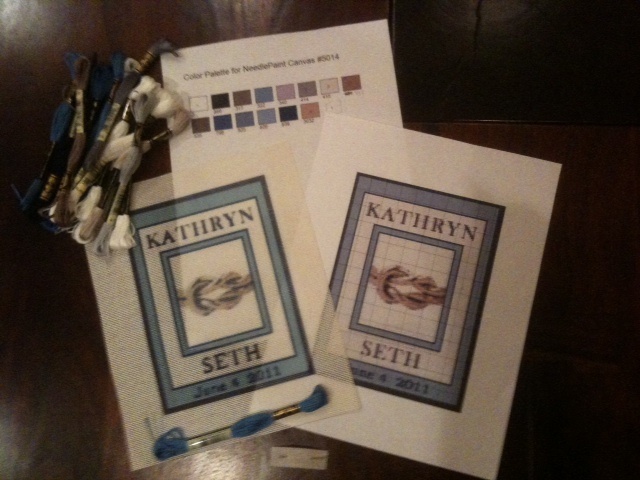 I’ve made a custom needlepoint kit for my wedding! It came out well, you can see the preview of the stitched canvas I uploaded last week. The letters were a bit fuzzy, but after looking at the canvas, these will be easy to do. The NeedlePaint needlepoint kits include all the floss, stitch guide, and needle. So, where does a beginner start? I’ve been wanting to learn needlepoint, and this is a great reason to start. What I’ve found are some great instructional pages and videos! I started at About Needlepoint and came across Susan Battle’s how to needlepoint videos. The videos are a much easier starting place for me, as Peggy is out of town, and I don’t have anybody to walk me through counted stitch guides. The continental stitch will be perfect for doing all the sides and boarders, so I’ll start there and update the blog with as much helpful information for beginners or people who have not stitched in a long while. My fiancé was looking at pictures at stylemepretty.com to get ideas for our wedding this summer and came across an amazing needlepoint pillow! 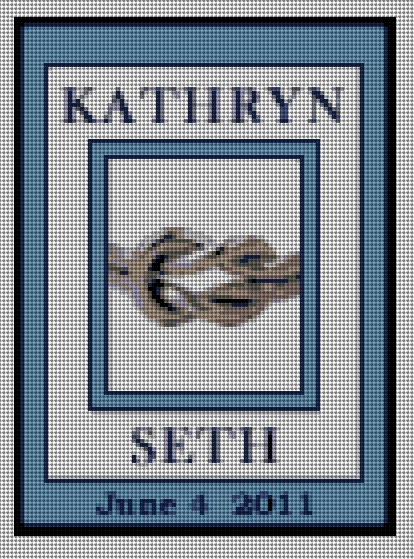 I love the idea of a ring bearer pillow, so I have gotten to work on designing our own custom needlepoint kits to make a pillow for the wedding. I don’t want the pillow to be too large, so we’ll need to work on a way be sure that our names fit. The size I’m making is 5” x 7”, which we plan to leave in the house as decoration. A 10 x 10 will also be fine, and may be more practical, but I want something a little smaller for my nephew. You can see the preview of my design below, after I uploaded it to Needlepaint! 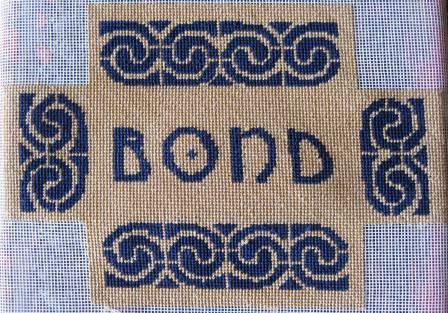 My great-aunt, Mrs. Jo, loved to do needlepoint. She was prolific! She was always looking for something new to do. My mother, sister, and I would bring her printed pillow tops, bell pulls, and seat covers. When she finished these, and if we were slow in bringing her new projects, she would use the left over yarn to make brick covers with random triangle patterns. The covered bricks were our door stops. So, I didn’t have slamming doors until the covers wore out recently. Mrs. Jo has been dead for over 30 years. I was on my own to make new ones. Bricks are BIG! On my trip to Home Depot to buy a brick, I discovered that all bricks are not created equal and there is a myriad of size choices, including a small “paver.” I wasn’t sure that the paver would be heavy enough to hold the door open, so I bought one for a test. To my delight, it worked – less time, fewer stitches, less yarn, less canvas. Voila, the mini-brick! The pavers are 6” x 3” x 1.8”. The overall dimension of the design on my Needlepaint–custom needlepoint canvas was 10” x 7” and the design was inspired by Dover Publications Celtic Art books with CD-ROM. I framed up my canvas and went to work. I was pleasantly surprised at how quickly the 14 point canvas worked up, compared to the larger brick I had finished previously. Also, having used a large scroll frame(12” x 12”), the canvas remained square and need very little blocking. I used a variation of Henry Babcock’s instructions for finishing the brick , which was that I wrapped the brick in flannel to protect my Needlepaint canvas. Then I followed Henry’s directions. Now I have one less door slamming closed.